Earn $7.35 in VIP credit (735 points)What's This? With it's Downhill pedigree, the Minion DHF MTB Tire will give traction in almost any environment. Originally designed for DH, the Minion DHF's tread pattern has been around for years because it works. Now available in this 27.5 x 2.6 inch version, those using the middle of the road tire size can benefit from the incredible grip offered by the DHF. Whether cornering or ripping down a straight, and regardless if you're rolling through mud, loose conditions, or hard pack, these tires will keep the bike under you. 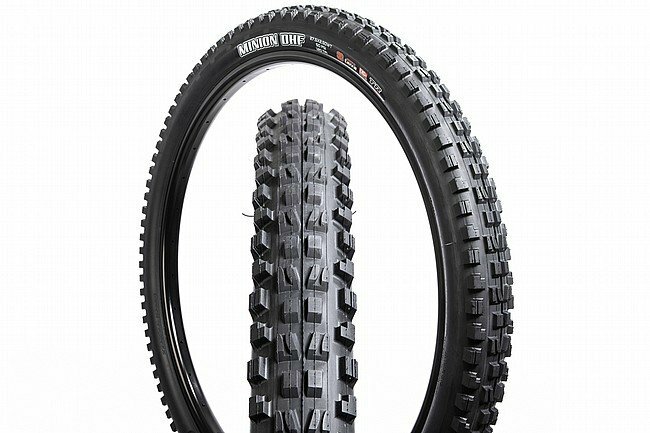 The Minion DHF 27.5 Inch MTB Tire measures 27.5 x 2.6 inches (60-6584 ISO). Black. 120 TPI. 925 grams. Best and most durable mtb tire made to date for the rocky desert terrain I ride. Bites on everything else too! Tremendous traction in the damp and loose NW Spring trails. I've run a much more rounded balloon style small knobby tire the past 2 years that worked great on dry and slick rock (Sedona, etc.). These new tires are more suited to the typical NW trail with a variety of damp, wet, rooty and dry. Will especially appreciated the traction on short steep uphills and cornering.